Micro-sized agents can be used in applications such as microassembly, micromanipulation, and minimally invasive surgeries. Magnetic agents can be controlled to deliver pharmaceutical agents to difficult-to-access regions within the human body. A major requirement for the implementation of these microrobotic applications is the precise control of the microrobots. In particular, a magnetic-based control system should be robust to parameter deviations, such as time-varying fluid viscosity and channel wall effect. 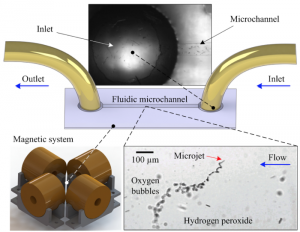 Project: In this project, the student will evaluate and design motion control algorithms for micro-sized agents moving into fluidic microchannels.